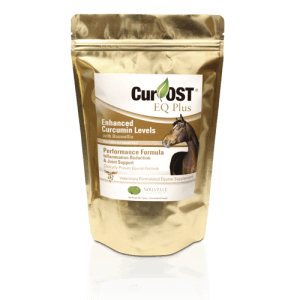 Cur-OST EQ Rejuvenate Whole Food Nutrient Support Formula to Optimize Equine health. 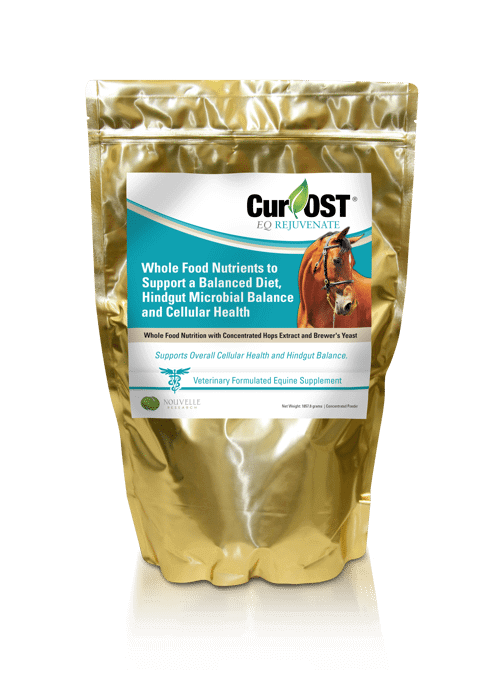 Boosts the equine diet with naturally occurring nutrients and prebiotics to support healthy hind-gut microbial balance, digestion, and cellular health! No additives, preservatives, synthetic nutrients, or artificial flavoring. Cur-OST EQ Rejuvenate is a true whole food nutrient supplement to support a balanced diet and cellular health, while promoting hind-gut microbial balance with a concentrated Hops extract and Agrimos® brewer’s yeast. Agrimos® yeast provides concentrated beta-glucans and MOS prebiotics to promote a healthy gut. 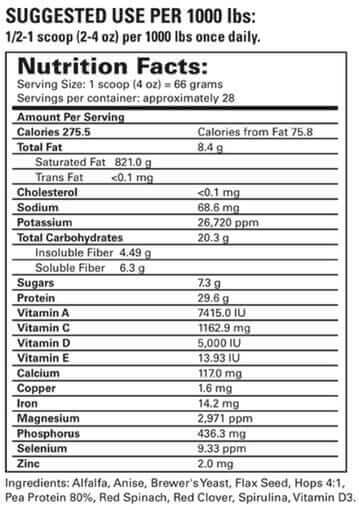 Contains no additives, fillers, artificial flavors or synthetic-based nutrients. Complete, natural source of protein, fats, carbohydrates and over 25 naturally occurring micro-nutrients. Nutrition is the key to overall health, soundness and performance in the equine athlete. In many instances, the diet is lacking in vital protein and micronutrients. Ideally, we want to provide these nutrients in their natural, whole form from nature, which is better absorbed and utilized by the body due to naturally occurring cofactors present in the food source. 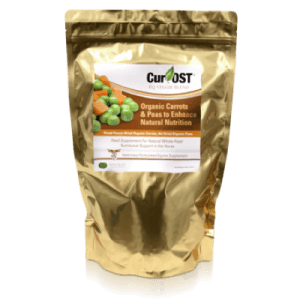 The Cur-OST EQ Rejuvenate provides a whole food natural blend of Alfalfa, Spirulina, Pea Protein, Red Clover, Red Spinach, Aniseed, Flax, Agrimos® Brewer’s yeast and a concentrated Hops extract. Hindgut health plagues many horses, contributing to gastric and hindgut ulcers, diarrhea, irritability and even inflammation and immune related conditions. Research has indicated that in many metabolic patients with laminitis, there is an overgrowth of Lactobacillus species bacteria which may be contributing to hindgut concerns and even leaky gut syndrome. The use of Hops has been demonstrated to help reduce Lactobacillus populations, potentially minimizing their impact on hindgut acidosis and other health related conditions. Saccharomyces cerevesiae or brewer’s yeast, has also been shown to aid in stabilizing the hindgut bacterial population, minimizing fluctuations associated with stressful situations, while also providing beta-glucans and MOS prebiotics to aid with healthy flora. 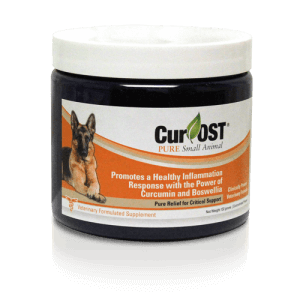 Cur-OST EQ Rejuvenate is helpful in promoting health in a variety of conditions, through the provision of nutrients in their natural form to aid in cellular health and repair, but also by supporting hindgut health and balance. The perfect supplement for any regimen. Supports body condition, performance, hooves, skin, muscle development, hindgut and overall health, through provision of nutrients in their natural form for easy digestion and assimilation. How does the EQ Rejuvenate work and benefit my horse? The EQ Rejuvenate formula is a whole food source of protein, fats, macro and micronutrients to help keep your horse healthy in many ways without added preservatives, additives or synthetic nutrients. The EQ Rejuvenate is a great way to add needed vitamins and minerals, plus protein to your horse’s diet in a natural, whole food way, to support health, including the skin, hair and hoof condition. It also has the added benefit of supporting natural bacterial populations in the gastrointestinal tract through naturally occurring prebiotics and added Hops. Can I use the EQ Rejuvenate with other supplements and feeds? Yes, the EQ Rejuvenate is fine with other health supplements and feed regimens, however, caution should be used with used with concurrent vitamin/mineral supplements with the goal not to overload your horse. Do most horses readily accept and eat the EQ Rejuvenate? Yes, most horses readily consume the EQ Rejuvenate when supplemented. There are no added flavors or dyes to the formula. The EQ Rejuvenate is all naturally flavored. I use this formula on a 5 year old off the track barrel horse. He is sensitive to feed changes and starch. Works awesome and has really leveled him out. Couldnt be happier!